Some files and folders are hidden by default. For example, this is true for the Microsoft Word STARTUP folder and it may also be true for the folder in which the Word template Normal.dotm is stored. Open a Windows Explorer window (File Explorer in case of Windows 10). Windows 10: Select File > Change folder and search options. Select the View tab. Microsoft Windows Vista, Windows 7 or Windows 8: Click Organizer in the top-left corner of the window. Select Folder and Search Options. Select the View tab. Windows XP: Select Tools > Folder Options. Select the View tab. 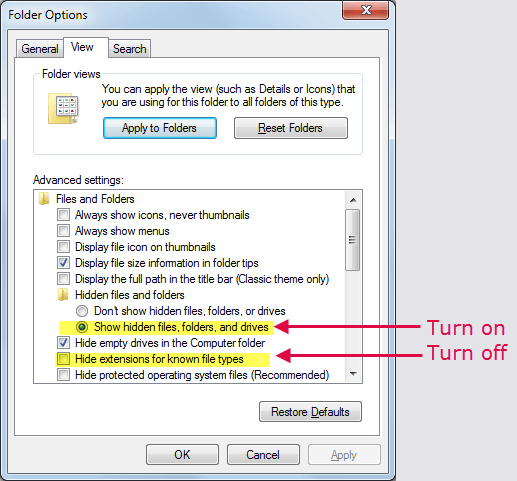 Turn on Show hidden files and folders. Turn off Hide extensions for known file types. When Hide extensions for known file types is turned off, you will see files names as e.g. MyAddIn.dotm instead og just MyAddIn or MyDocument.docx instead og just MyDocument. It is helpful to see the file extension since it provides information about the specific type of file. Figure 1. Folder Options settings. Note that the options are sorted alphabetically. If you are not using an English system, the options will be named and thus sorted differently. Now the files and folders that were previously hidden should be visible.